The Sanctuary of Asklepios at Epidaurus is renowned for its influential healing cult and Hellenic architecture, especially its theatre. 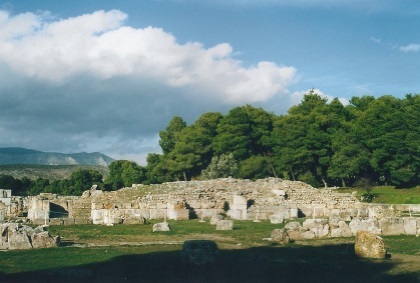 The site is situated on the Peloponnesus peninsula. To the ancient Greeks Asklepios was the God of Medicine. A son of Apollo, he was given the healing gift after his mother died at his birth. From the 4th century BC, Epidauros became widely known as a sanctuary to Asclepius. There were temples and hospitals here, and people from as far as Rome to seek help. Treatments included licks from snakes. Also, every four years the Festival of Asclepieia took place at Epidaurus. Dramas were staged and athletic competitions were held. Today's best preserved building - the theatre - links to this. The site lies in a darkgreen pineforest, with air as healthy as you normally can only wish. There's a huge parking lot, but at the end of December I was one of only a few guests. I had the amphitheatre, that sits 14.000 people, to myself. It's like a football stadium, without the fences and the advertising. Unbelievably well preserved also. Besides the theatre you can visit a museum with local findings (mainly statues), and the excavations. Not much is in place of the hospitals, hostels, bathrooms and what more was needed to serve the stream of visitors looking to improve their health. The location of the site is its major drawingcard. It's like a retreat, like the secluded places where they construct monasteries in Japan or South-Korea. Having discovered that the Robert Wilson production of Oedipus by Sophocles, which premiered in Pompei last summer and which I watched in Vicenza this month, will also be staged in Epidaurus next June (three World Heritage theaters! ) , I had to reminisce my absolutely unusual and even surreal experience I had when I visited Epidaurus. I believe it was the summer of 2004 right before the Athens Olympics. That was when I toured Greece visiting most of the WHSs in Greece I have visited so far. In Athens I purchased a ticket for the National Theater of Greece production of Lysistrata, a comedy by Aristophanes, at the Epidaurus Theater. The amphitheater is the summer home of the National Theater of Greece based in Athens, and I just thought, what could be the better way to experience this most complete Greek theater in the world than watching an actual Greek play there? But the ticket I purchased was actually for the whole tour from Athens to Epidaurus, which included a bus ride from Athens to Pireas, a ferry ride from Pireas to some port in Peloponnese, and another bus ride from there to Epidaurus and the same on the way back. I did not know what I got myself into. They just told me to get on the bus in Athens at 4 pm. When I boarded the ferry and freely walked around the boat was when I realized that, not only was I the only Asian on this boat, but also I was the only foreigner. This meant that the tour was catered for the Greek people. Whatever I was doing, everybody was looking at me. I had Souvlaki for dinner at some corner. The ferry ride lasted about 3 hours. From the bus parking lot in Epidaurus we walked several hundred meters to the amphitheater, and I would assume that was my opportunity to see other components of this site. But partly because it was already dark, I do not remember seeing anything of significance. Seeing from the fact that several dozen other Greek or Roman amphitheaters around the world have been struggling to keep themselves in good shape, the existence of the Epidaurus Theater in such an impeccable condition, with its famous acoustics, must be considered a blessing. The play or the Greek comedy started at 9 pm. Even though I could hear actors' voices clearly from my seat on an upper row, I didn't know what they were saying. But I knew the story line, and the jokes were pretty straight forward and indeed funny. The most extraordinary part of this tour was actually on the way back on the ferry. It left the port after midnight. What were we going to do on the boat from mid-night to 3 am? There were only tables and chairs in the inner deck, so some people, including myself, started sleeping on the floor, while most others were still drinking merrily. But there was this Greek crooner, whose job was to entertain us, and he kept singing for the entire 3 hours! And it wasn't Elvis or Moon River. He sang in the language I don't understand! What was even more problematic for me was perhaps the fact that this crooner looked exactly like the then world-famous Greek film director Theo Angelopoulos, one of my favorite filmmakers of all time. I'm sure everybody except me knew what the tour was going to be like. They knew what to expect. I didn't. We arrived back in Athens at 5 am! I had a full schedule that day to check out another WHS! Still, I would recommend this tour to those who are adamant on experiencing different cultures. This was before my time with digital camera, so I don't have any photo to upload. The Temple of Asklepios was known as a Sanctuary of Healing. As such it was the centre of medical research and treatment for the entire Greek and Roman world. The site includes a hospital, baths, doctor's accommodation, hostels and sporting facilities. Nearby is the theatre, which continues to provide entertainment. I visited this WHS in June 2014. Having visited quite a number of classical WHS in Greece I took advantage of the long summer opening times and visited Epidaurus after 5pm. This meant that not only all the tour groups and coaches had left, but at times I was practically the only visitor around. I headed first towards the stadium and then walked among the ruins and numbered remains scattered around the few standing columns remaining. Then I visited the archaeological museum which has several stone and marble statues on display and then I ended my visit with the main highlight, the huge Epidaurus Theatre that has a seating capacity of 14000! If you are lucky enough to visit when there are Greek theatrical arts or operas played here do visit! The acoustics are close to perfect. Most people rave about the theatre, but the real attraction is the sanctuary. The current curator has a programme of limited restoration - the main target being the Tholos, but the rebuilding of a section of the Propylea and the Abaton are astounding - would that the whole of the magnificent entrance could be restored. Well worth a visit - forget the theatre! The theatre is justly famous. When I was there, several children were testing the "you can hear a coin drop from the top tier" claim; it really is true! 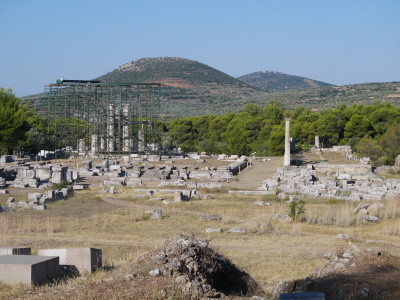 More interesting to me, however, was the sanctuary itself, with its hotel, baths, cafeteria (later transformed into a theater by the Romans; why they needed one when they had the great theatre a few hundred yards away is a mystery to me), tholos, and temples. Extensive reconstruction work was under way during my visit in 2006. Far from being a nuisance, it was fascinating to see the care and diligence with which the Greek people and their benefactors work on the ancient sites. This site was one of the most comprehensively sign-posted and hence easiest to understand (though I suspect you could study it for many years and never get it all) of all the places in Greece we visited. Undeservedly little known to many people, the site of Epidaurus is really one of the nicest and most interesting places to visit in Greece. The amphitheatre boasts great acoustics and is one of the best preserved ancient sites anywhere, and the rest of the archaeological area is very interesting as well, especially when you hear about the history of Epidauros as a kind of ancient spa and medical resort that featured hotels, hospitals, and bathrooms. The museum is pretty small, but has some interesting artifacts. The place is only about two hours from Athens and can easily be combined with trips to places like Corinth and Mykene. Epidauros theater is the best preserved and thoroughly of Greek design that I have ever seen, although some of it has been restored. The acoustics are amazing. The only theater that comes close in size is the one in Syracuse, Sicily. Epidaurus is one of the most renowned of Greece’s ancient sites and regular buses runs between Nafplion and Epidarus making the “sanctuary of Asclepius” easily accessible. The famous theatre, which seats up to 14.000 people, actually a later “add-on”, is still used today for performances of ancient dramas. 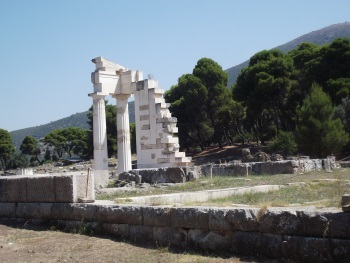 My tour to Greece including Athens, Delphi and Peloponnesus, passing through Corinth, Olympia, Mystras, Mycenae came to a worthy end at Epidaurus, a tour through classical history and highly recommendable to anyone who have the time and interest to do it. I promise you it will be rewarding. 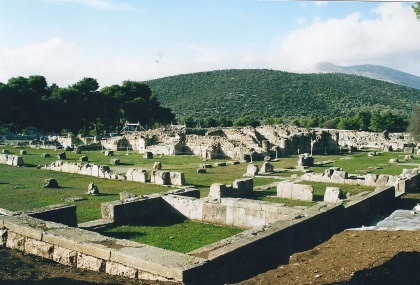 From "Archaeological Site of Epidaurus" to "Sanctuary of Asklepios at Epidaurus"
Piracy: AB evaluation: "despite pillaging by ... the Cilician pirates, the restored sanctuary prospered during the Roman period as witnessed by the famous description by Pausanias in 150 A.D."